In the first days of May 1989, Dalton drove his 1975 bright red Coupe de Ville Cadillac up North C Street and carefully parked it with the nose facing out directly across the street from the Loaves & Fishes dining room waiting area. He got out of the car, walked slowly around it, looking carefully for any smudges that might have developed during his drive from the automobile dealer’s used car lot a few miles away. Finally satisfied that every square inch gleamed just so, he stood tall and erect at the street’s edge barely an inch from the Cadillac’s front fender but still careful not to touch it. Dalton’s “open house” was now open. Slowly at first, homeless guests from Loaves & Fishes, who were waiting for the start of the free home-cooked hot meal served every day of the year, sauntered across the street to see the Cadillac and hear Dalton’s story. Dalton beamed his biggest smile at them, explained he had used his SSI “retro” check to purchase the car, and began to point out its many features. He would open the door and allow people to look in to get a closer view of the dashboard amenities, but he did not allow anyone to sit down on the leather seats, handle the steering wheel, turn on the radio, or otherwise get a better feel for the car. Within a few hours, every guest at Loaves had made his or her way to Dalton’s show-and-tell event. This same event was played over again every day for the next two months. Finally, there was no one left who had not seen the car close up, talked to Dalton about its many features, and heard the story of its purchase. This particular news story had played itself out and people were ready for something new. But there was no doubt that when the story first broke, the people at Loaves & Fishes – homeless guests, staff, and volunteers – were impressed with Dalton and his new car. I was among them. How could this be so, I asked myself. How could a homeless person with barely a dollar in his pocket be driving a spiffy gleaming red Cadillac to Loaves & Fishes to partake of a free meal? It made no sense to me. Could Dalton’s Cadillac symbolize a kind of societal nonsense? Perhaps. Somehow Dalton managed to win his case. Perhaps he was one of the exceptions to the semiautomatic rule, I don’t know. From start to finish, it took several years, but his disability was finally approved, and six months later he received his retro. The amount of the Social Security disability award is counted from the date of the first application. Therefore, if the applicant’s case were to take a total of four years, let’s say, the amount of the retro could be about $34,000. The attorney’s percentage fee is approximately $5,000, leaving a $29,000 nest egg in the bank to be used, one would hope, to supplement the $730 a month disability stipend by an additional $500 a month for the next five years. Wrong. Social Security regulations require the recipient to spend the balance of the retro within a few months or forfeit it. Realistically, what does a disabled and homeless person buy with this $29,000? The first to be paid back are the friends and relatives from whom money was borrowed during the application process, especially after the official notice of approval was received. During the intervening six months, between the notice of approval and the retro payment, the disabled homeless person actively borrows funds from friends and associates using perfect collateral: the full faith and credit of the United States of America. Well, then, if not every dollar borrowed is paid back, at least close enough to satisfy expectations and keep the peace. Personal needs come next. Some clothes and shoes, probably, but more important, now that the financial ship has come in, there is money to spend entertaining and treating friends, especially girlfriends or boyfriends. Not only is the homeless disabled recipient expected to share the retro wealth, but he or she is making a wise personal investment to qualify for future dividends in the form of friendships, in-kind services, and small loans. Finally, this will be the last chance in the recipient’s lifetime to buy something big. For some disabled homeless recipients, it may be a used camper or a small used truck, but for Dalton it was a 1975 gleaming red Coupe de Ville with a two-tone hardtop and porthole windows in the backseat. Undoubtedly, the automobile remains the most beguiling and hopeless choice, because it is precisely the kind of purchase that cannot be supported and sustained. The newly qualified Social Security disability recipient will never be able to afford the annual registration fees, the required insurance, the gasoline, and the sure-to-come-all-to-soon ongoing repairs needed to maintain a used car. What would I do? Buy a car, of course. The automobile means I am not really homeless, I am not destitute, I can go where I please, I don’t have to come to Loaves & Fishes to eat if I don’t want to, I can drive my friends places, I am an independent person, and I am still useful. To make my point, I use the example of my 91-year-old Republican mother-in-law, who has a 1965 Cadillac parked in her garage that she has been unable to drive for at least eight years now and will never drive again in this lifetime. Selling it is out of the question. Her car is the ultimate symbol of what she once enjoyed, and may again somehow. The rest of Dalton’s story is as sad as it was predictable. With only a few minor variations, I have seen the same ending dozens of times before. After the newness of the prized red Cadillac wore off in the Loaves & Fishes community, Dalton began to offer a poor man’s taxi service. Homeless people have to walk to whatever service point they need, whether it be a mile or two or six or seven. Public transportation, especially light rail, is not an option, for two reasons. The first is that it costs too much; the second is that most homeless people have outstanding “failure to appear” bench warrants, which have been issued because of previous citations for light rail fare violations. Dalton’s private limousine-like taxi service would be of help because he needed the gas money and the passengers needed the ride. Sad to report, it never worked out. Dalton needs more gasoline money than people can afford to pay. Sometimes he gives free rides to his friends, so why not to me, someone asks. Or he is not ready to drive when people need to go. Or he doesn’t want to go as far as some of his passengers need because he believes it will add too much wear and tear on his new/very used car. The taxi service finally collapses because of misunderstandings, hard feelings, and all the yelling and shouting that go along with sorting out these arrangements. That dreaded day arrives too soon. The Cadillac needs a minor repair. Dalton has to choose between spending his monthly benefit for temporary housing or the car repair. Much to the annoyance of his girlfriend, he chooses the Cadillac. Both are now living on the street again. Well, not quite, because they can live in the Cadillac for a while until Dalton can again use his monthly stipend for some housing. That day never comes. Because of repairs, gasoline, and registration costs, the car expenses continue to eat up just enough of the monthly income to make any kind of rental housing out of reach. Maybe next month, he says. Living in the Cadillac soon takes a toll on the car’s pristine appearance. At first there are nicks and scratches, then a small dent, followed by a bigger one. The upholstery, leather or not, cannot take for long the nightly abuse of two sleepers. It begins to tear, and some of the seat stuffing begins to show. 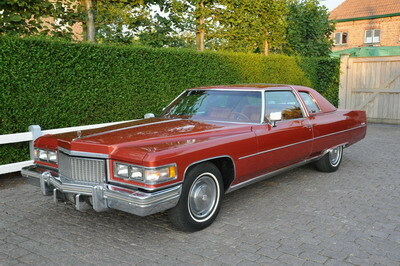 Increasingly, the Cadillac becomes filled with stuff, which further accelerates the deterioration process. Less than a year from the date of purchase, I find Dalton’s Cadillac abandoned next to a warehouse complex two blocks away from Loaves & Fishes. It is barely a shell and shows no signs of its previous elegance. A pitiful end for a gleaming red 1975 Coupe de Ville. A few weeks later, it is towed by the city to the junkyard, where it can never be reclaimed because the storage expenses soon outstrip the car’s worth. Dalton is resigned once again to being homeless, his retro has been spent, and his disability benefit is too small to afford to rent a permanent place. His choices are simplified once again: a few dollars in his pocket and life on the street, or his full monthly stipend toward a month’s rent and utilities. What choice would I make? The same one Dalton does. Fortunately for me, I was not one of the key volunteers who needed to be pushed out of the farmworker movement. I left long before I wore out my welcome. But had I stayed, and I certainly had the opportunity to do so, the time would certainly have come when my personal priorities would have clashed with the needs of the movement, and I would be out – friend or no friend- of Cesar Chavez. I do not deserve much credit for my voluntary departure, because I had a foreshadowing of what lay ahead for me. After Cesar’s funeral in 1993, I wrote a manuscript, which I entitled “Cesar 1968.” In this document, I recount a conversation Cesar and I had late in the evening the night before the 1972 California general election, an election which would determine the fate of Proposition 22, the anti-union initiative sponsored by California agribusiness to outlaw farm labor unions. I wrote, “So there we were, just Cesar and me, sitting in the big open room of our ‘No on 22’ campaign headquarters looking out onto Olympic Boulevard five stories below. It was very late in the evening, everyone had gone home or back to our farmworker encampment at Lincoln Park to get some rest for another early morning of human billboarding and our ‘Get Out the Vote’ drive. Cesar was tired, and very nervous about the upcoming election. I was very uptight myself, and wondered if there was any last-minute campaigning that we could do. Just a few days before, with the help of our Hollywood media contacts, I had been able to arrange for a 30-second ‘Cesar Chavez No on 22 spot’ to be aired on the Archie Bunker show. It was very expensive, I forget how much, but all the media experts said it was worth it, and a coup to even break into the show. I remember being afraid to blink for fear I would miss it. Cesar spoke very softly with a friendly but nervous edge to his voice. He simply explained to me that if we lost the election tomorrow, I would have to take the blame. I couldn’t answer. I was totally silenced by the harsh reality of what he had said. I was completely helpless. My closest friend, almost nine years now, had just explained the political facts of life to me. I had worked on this life-and-death campaign full-time since July, barely had any time to even see my wife, Bonnie – to say nothing of my four daughters – unless she was in the office working. 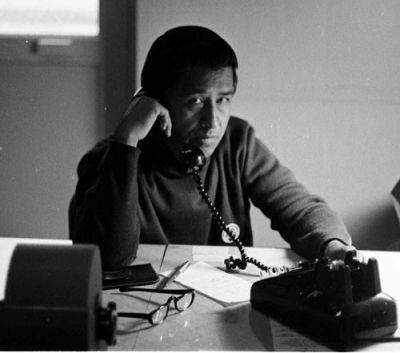 I worked very late into the night plotting strategy on the telephone with my staff directors in other California cities, and then worrying half-to-death about everything because of the high stakes involved for Cesar and his farmworker union. Now, to top it all off, I was expected to play the role of a fall guy, the person responsible for this historical defeat. I didn’t answer Cesar. I just nodded and gave a shrug of the shoulders. The union won! Proposition 22 was defeated 58% to 42%. (Nixon beat McGovern 54% to 40%). I did not feel like going to the victory celebration because I am very uncomfortable at those kinds of events, but I did make an appearance at the tail end of the party. Everyone was pretty drunk by that time, and thank God, all of the speeches were over. I didn’t have to stay long. Cesar tried to make it up to me. The farmworker union had a big ‘Welcome Home/Thank You’ dinner party in my honor for all the staff and their families at the La Paz UFW headquarters in the Tehachapi Mountains. There was a banner in the dining room that called me a ‘Giant Killer,’ and Chavez made a big to-do about my work in the campaign and how I saved the union from the power of the growers. But I was mature enough to know that just because Proposition 22 had been defeated, it made me no more a ‘Giant Killer’ than, had it won, I would have been the person to blame. Winning or losing Proposition 22 wasn’t about me, or my friendship with Cesar, it was about him and his relationship with his vision, his farmworker movement. That was the only thing that mattered. I remember this incident as clearly today as if it happened last night, and I’m grateful that it happened, because it helped to spare me from the day, which surely would have come, when Cesar and I would have been forced to part company. I did not leave the farmworker movement because of this incident, but it certainly helped to lay the groundwork for my voluntary departure in August of the following year. The conversation that evening, high above Olympic Boulevard, reminded me again that this was not my cause. I had only come to the farmworker movement to help Cesar with his cause.